Four generations of Mirandas lived in Clifton beginning with my great-grandfather, Manuel, in the late 1870s. My grandfather Romulo was the last Miranda to live permanently in Clifton, and he moved away for good in 1983. The family house remains in the town, just behind the Sacred Heart Catholic Church in the Chase Creek section of town. The Family House since the late 1800s. 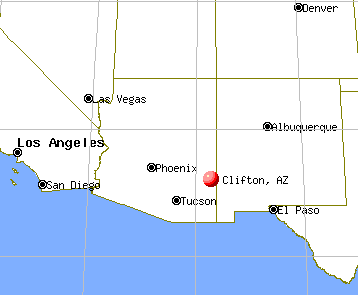 Clifton is the county seat of Greenlee County, Arizona and one of the oldest continuous mining communities in the Southwestern United States. Some researches believe that the Spanish explorer Francisco Coronado passed through present-day Clifton on his famous expedition from 1540-42 in search of Cíbola, the fabled “seven cities of gold.” There are several theories as to how Clifton received its name. One is that an early settler/mining prospector marveled at the impressive, red, overhanging cliffs of the present day town and therefore named the area Cliff-town. Another theory is that the town was named for an early prospector named Henry Clifton. 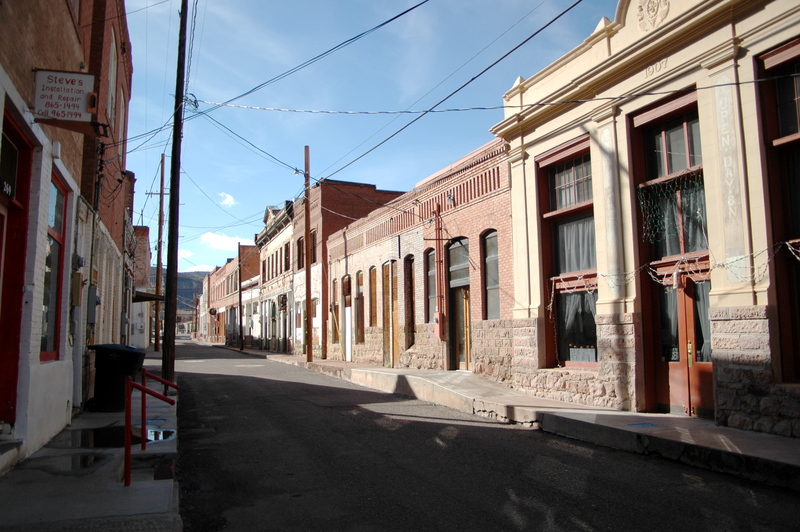 The town was founded in 1873 and originally was part of Yavapai County, before being transferred to Apache County, later Graham County, and finally Greenlee County. 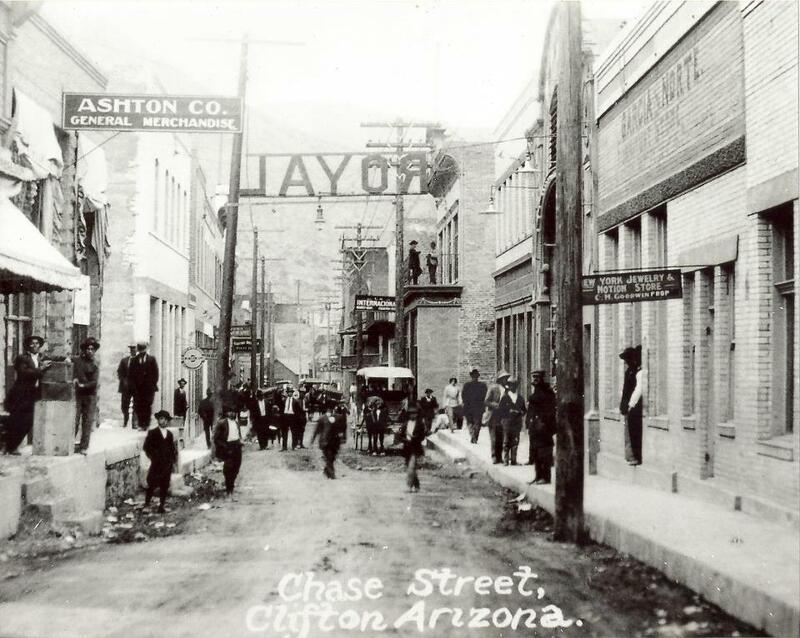 Both oral history and a review of historical newspapers from the area, Clifton had a reputation as a raucous frontier town, with little in the way of law and order. There are numerous stories involving gambling, prostitution, shootouts, strikes, and floods, helping contribute to the town’s place in American “wild west” history. According to U.S. Census data, Clifton had a population of about 600 people in 1880 and peaked at just under 5,000 people in 1910. From there, the town’s population dropped to a little over 2,500 by 1940 according to the U.S. Census. Today the population is estimated at a little more than 3,000 people. Throughout its history, Clifton has been tied to three major themes: the copper mining industry, labor issues-race relations, and flooding. Clifton’s existence as a town is entirely attributed to the copper industry. Its founding in the early 1870s by mining prospectors set forth a 100+ year marriage to the fortunes of copper prices. 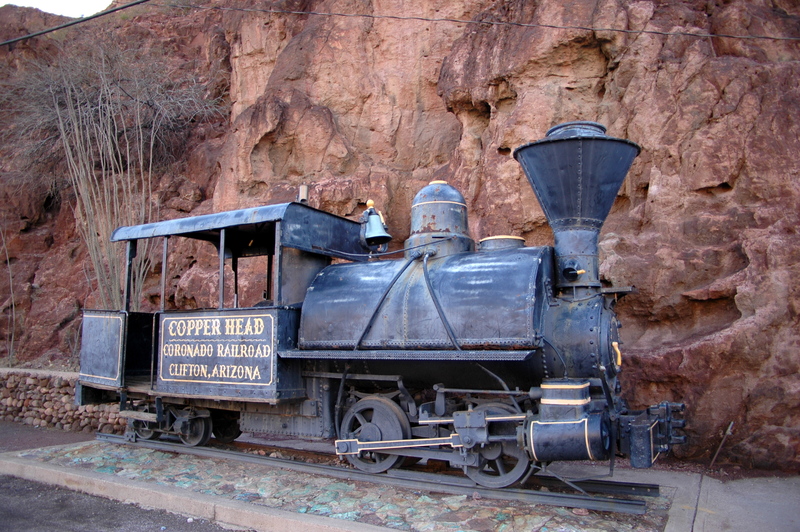 The original copper smelter was located in the town of Clifton, but copper operations in Clifton and neighboring Morenci has been managed by several mining companies, including: the Detroit Copper Mining Company, the Shannon Copper Company, the Arizona Copper Company, Phelps Dodge, and finally Freeport-McMoRan. 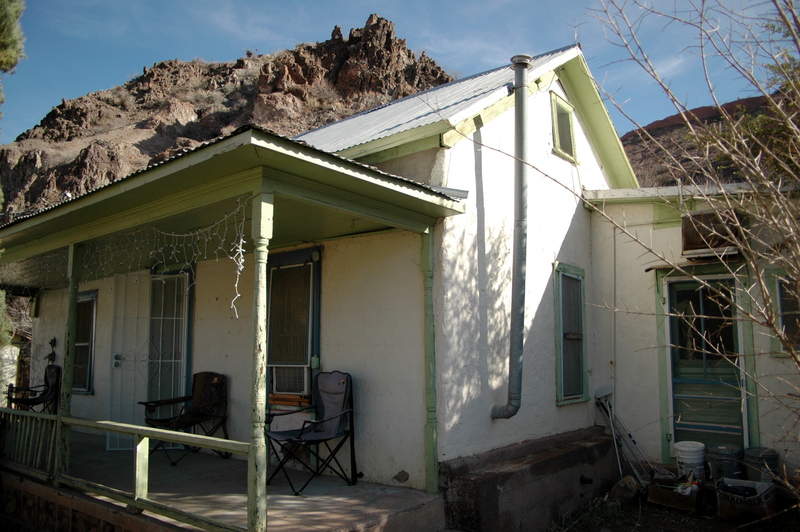 For much of its history, the Clifton-Morenci mining district was one of the largest producers of copper in the world. As telephones became commonplace in the United States in the early 1900s, the demand for copper soared, and copper towns like Clifton and Morenci took off. During times of high copper prices, Clifton experienced population and building booms. Conversely, when prices dipped, so did the fortunes of the town, leading to population exodus and labor issues. On several occasions throughout its history, the smelter was even closed due to the low prices of copper. Everything changed when the Phelps Dodge Corporation decided to abandon underground mining for open-pit mining in the 1930s, which sealed the fate of neighboring Morenci. The town was eventually swallowed up by the open-pit mine in the 1960s, leaving Clifton to stand alone. 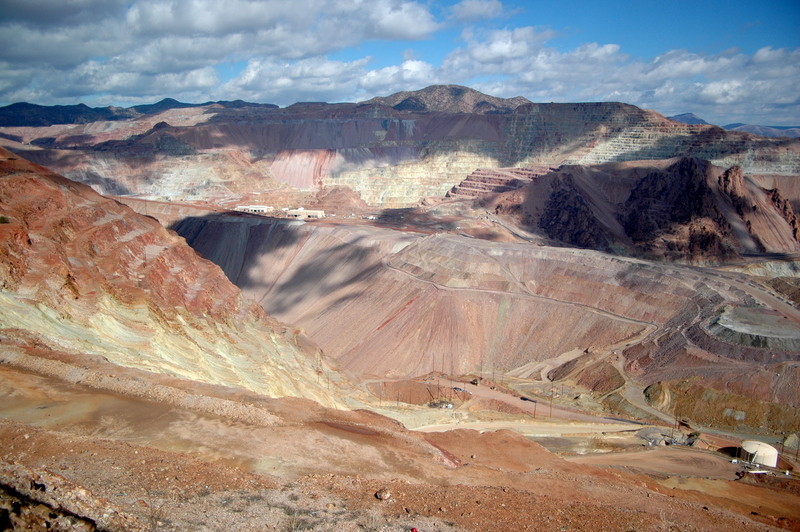 Operations continue at the open-pit mine north of Clifton, and the mine today remains the largest producer of copper in Arizona. 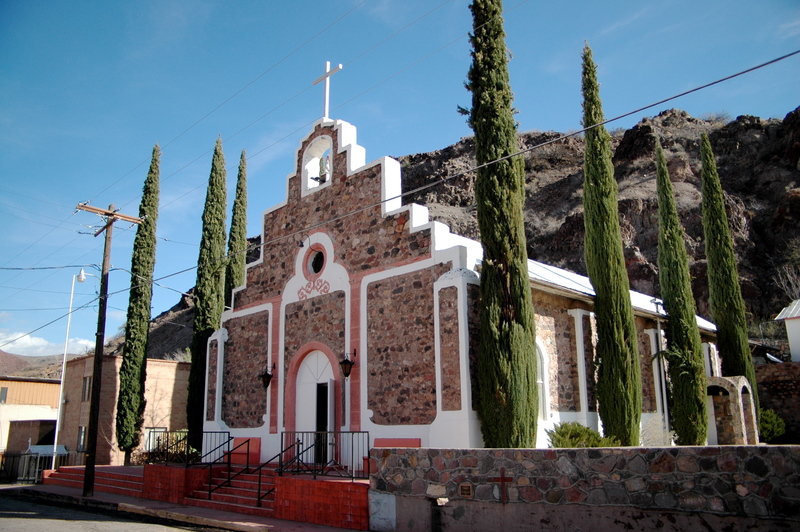 The early mining companies in Clifton-Morenci recruited Mexican miners, largely from the Mexican states of Sonora and Chihuahua, because they were considered experienced miners and would work for low wages. The Phelps Dodge Corporation utilized a “dual wage system” whereby they paid Mexican and Mexican-American workers half the salary of their Anglo counterparts for the same work performed. They were also paid by the hour, whereas Anglo miners were paid by the day. Finally, the Mexican workers were not permitted to unionize, meaning they had little chance of improving their working conditions, hours, and salaries. When Phelps Dodge decided to cut the workday from 10 hours to eight hours in 1903, the Mexican workers lost 25 percent of their salaries. As a result, some 1,000 mostly Mexican (but also Spanish and Italian) miners decided to strike – the first known organized strike in Arizona’s history. The June 12, 1903 article at left from The Washington Post describes the tense situation, in which the miners armed themselves and shut down the smelter. The Arizona Territory authorities appealed to President Theodore Roosevelt for help, and the President responded by sending federal troops to put down the strike. Torrential rains, leading to a major flood, helped put a stop to the strike, and federal troops later arrested some dozen strike organizers. The strike was a failure, and Phelps Dodge’s dual wage system continued. Another major strike occurred in late 1915, when miners in Clifton, Morenci, and Metcalf walked off the job to again demand equal pay as well as better working conditions. The strike lasted more than four months, and was ultimately resolved in February 1916 when then-Governor George W. P. Hunt agreed to mediate between the Detroit Copper Company and the unoffical Mexican-American mine associations that organized the strike. One of the strike leaders was a great-great Uncle named Manuel Lucero (eldest brother of my Great Grandmother Anna), who was President of Clifton’s local miner’s union. In December 1915, Manuel was one of 22 strike participants ordered to appear at the district court in Tucscon. This strike was utlimately successful in that the Detroit Copper Company agreed to a sliding wage scale that was tied to the market price of copper, meaning that workers received higher wages while copper prices were high. The article at right is from the February 4, 1916 Copper Era newspaper is a letter describing the end of the strike and includes the signature of Manuel Lucero. In his book, Corridors of Migration: The Odyssey of Mexican Laborers, 1600-1933, Rodolfo Acuña notes that despite the minor victory, strike organizers were considered agitators and forced to scatter, with many (including Manuel Lucero) leaving Clifton for good. While not directly related, see the Bisbee Deportation of 1917. The Mexican-American miners were also prevented from forming a union until years after World War II. Clifton and Morenci men made up the estimated 350,000 Mexican-Americans that served the United States armed services during the war. Despite their service (including many officers), they returned to the prejudices and unfair labor practices that continued in the Clifton and Morenci mines. And yet, war became the catalyst for bringing about change. The first Latino mining union was formed in the years following World War II and finally abolished the dual wage system and established a series of first-time benefits for Mexican-American workers. For an excellent discussion of the 50-year struggle of these Mexican-American miners, see Hector Galan’s moving 1991 documentary Los Mineros on You Tube. Unfortunately, there is not a happy ending. On July 1, 1983 the existing contract between the 13 unions representing copper miners at the Morenci open-pit and the Phelps Dodge Corporation expired. Workers at the mine walked off the job, while the union heads entered into collective bargaining discussions with Phelps Dodge. The early 1980s were tough times for copper, and prices had hit historic lows. In recognition of this, union leaders offered to accept a three-year wage freeze, but demanded cost-of-living increases tied to the rate of inflation. Phelps Dodge never blinked. Following confrontations between strikers and company officials in August 1983 that temporarily closed the mine, then-Governor Bruce Babbit ordered the national guard into Clifton and Morenci, inundating these twin sleepy mining communities in Southeastern Arizona with tanks, helicopters, and armed soldiers. While this ostensibly kept the peace, the strike continued until 1986. Scabs eventually crossed lines, pitting families and friends against each other. Eventually in late 1986, Phelps Dodge emerged victorious when the scabs became employees and “decided” against forming a union. 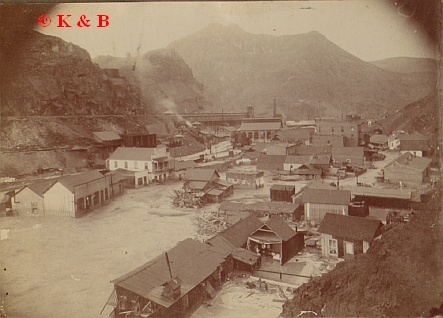 In many respects, Clifton and Morenci have yet to recover socially or economically from the what is now known as the Great Arizona Copper Mine Strike. Some estimates hold that nearly one-third of the towns’ population left, never to return. 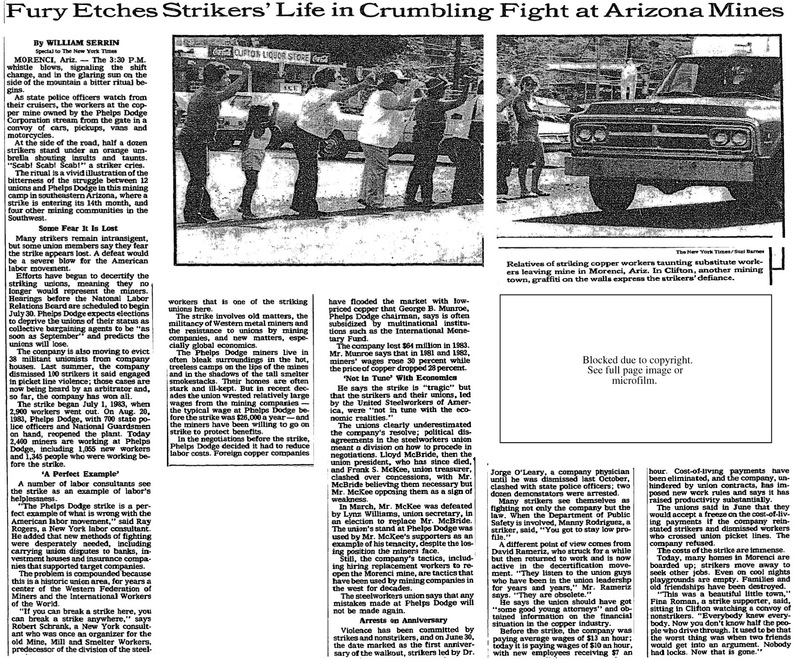 For some labor relations scholars, the Arizona Copper Strike became a symbol for the decaying power of unions in the United States. According to the U.S. National Geological Survey (USGS), Clifton has experienced at least 12 major floods involving the San Francisco River since the town was first settled in the early 1870s. The report notes that the combination of high cliffs, thin soil, intense mining operations, and the town’s proximity to the San Francisco River have all been contributing factors to the devastating floods. Historical newspaper articles chronicling the floods describe how the town was virtually wiped away on several occasions. From these articles, it appears quite clear that the 1891, 1903, 1906, 1972, and 1983 floods were the most devastating. James Patton’s The History of Clifton describes the 1891 flood: “the water covered the whole town from mountain to mountain. It washed away many buildings and moved the railroad track.” Later, he describes the 1903 flood noting that at least 13 people died, the Catholic Church on Chase Creek was washed away, and the copper mill ground to a standstill. As noted above, the 1903 flood was largely responsible for ending the 1903 copper strike in Clifton-Morenci. There were two additional “smaller” floods in 1905 and then a disastrous December 3, 1906 flood that destroyed nearly every building on Chase Creek, causing damages estimated at $1 million. According to Patton, the total damage caused by the flood was so great that there was much talk of abandoning the town altogether. 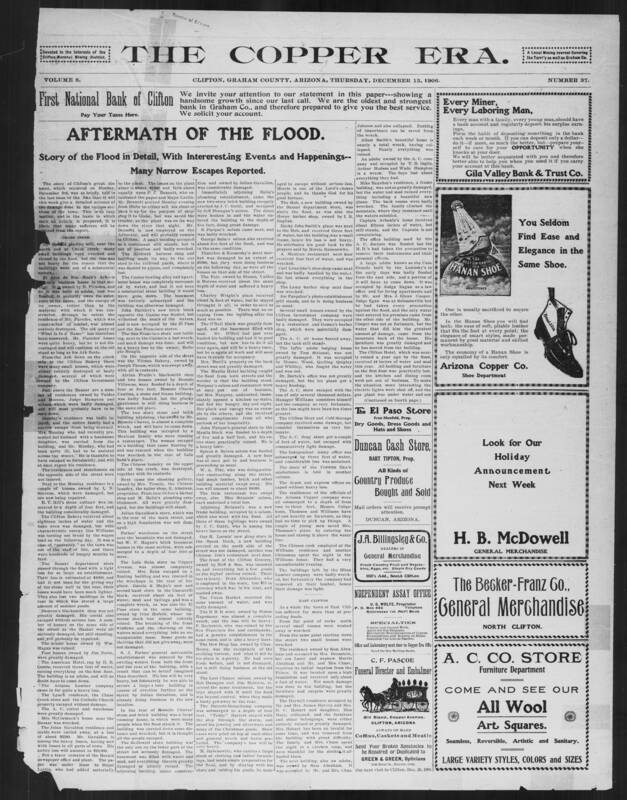 The article at left, “The Aftermath of the Flood,” is from the December 13, 1906 Copper Era newspaper, and describes the flood and damages to the town in great deail. Of note is the description of damage to several properties owned by my GGG step-grandfather, Romulo Chavez, a successful merchant and landowner in Clifton and a leader of the Mexican-American community there. The article notes that the Romulo Chavez Cantina was badly flooded but still in operation, while a two-story building owned by Chavez and rented as a restaurant was almost completely destroyed. In the end, after assessing the overall damage, the town leaders came together and worked with the cooper company to build flood walls. There was another moderately damaging flood in 1916 and then not again until 1972, which destroyed 105 homes and 24 businesses and prompted town officials to install a flood-warning siren. 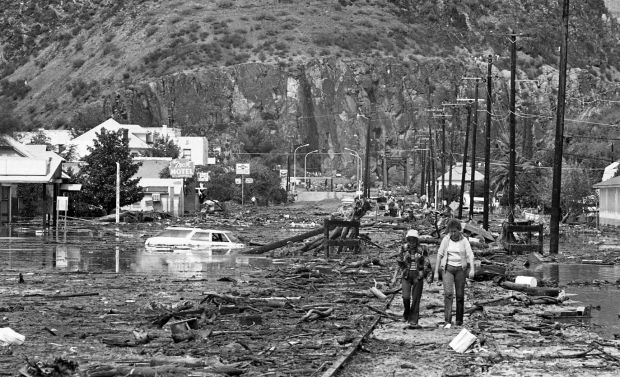 The flood of October 1-2, 1983 is considered the most damaging in Clifton’s history. The rains were the result of the remnant Tropical Storm Octave, which originated in the Western Pacific Coast of Mexico. According to the USGS report, between 6 and 11 inches of rain fell in Southeastern Arizona causing the river to overtop the flood walls. The flood destroyed 90 homes and 41 businesses, although there was no loss of life. Many locals in town have since claimed that despite no loss of life, the town never recovered from the physical devastation. Thankfully, there have been no major floods in Clifton since the 1983 flood.